After lunch, they allowed limited traffic. On the evening of 31 August, pro-Russian militants blocked traffic through the line of contact, with residents reporting thorough inspections and heavy presence of military hardware, the spokesman for the State Border Service, Oleh Slobodyan, has said on 112 Ukrayina TV. He assumed these measures would remain in place until Donetsk chieftain Oleksandr Zakharchenko is buried on 2 September. According to a later update, militants started to let certain people and cars to cross the line of contact. "What we know now is that the occupiers carry out total control of all individuals and transport attempting to leave the occupied territory and are now letting individual citizens and cars through," the State Border Service said. However, there are reports of numerous denials of passage. 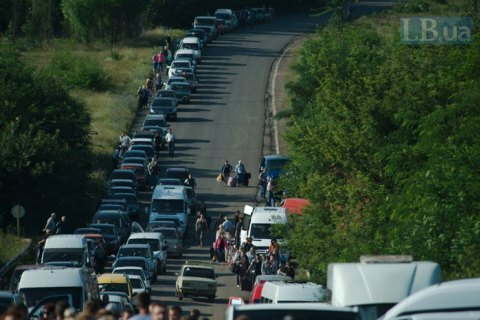 The processing of traffic on the Ukrainian side is done as usual. The separatist ministry of state security said all the checkpoints are in operation but tighter security measures are in place.